Roitman R., Lerner J., Korshun E., Ilnitskii A., Pozdnjakova N., Gorelik S., Bocharova K., Olenskaya T.
Currently protein- and peptide-based biologically active food supplements occupy a central position in the field of sport nutrition products [1,2]. Peptides have the same structure as proteins, but the size of these molecules is smaller. Despite the extensive product line of peptide-based biologically active food supplements their safety and efficacy is still disputable. Based on long-term scientific and clinical studies, researchers of the Saint Petersburg Institute of Bioregulation and Gerontology developed peptide bioregulatiors for application in case of various pathologies and in sports [3,4,5]. The use of the said peptides contributed to increased functionality of the brain, cardio-vascular and immune systems, improved the condition of bone and muscular tissues and physical activity [3,5]. The intake of peptide bioregulators by football players of “Zenit” FC during the period of 1999-2000 promoted activation of sportsmen vital resources by 15%. In practice this was evidenced by a unique (for the Russian Football Premier League 2000) win-win 13-match series and the Cup of the Russian Football Premier League later on. During the period of 2003-2008, the climbers of the “Russian path – walls of the world” project used peptide bioregulators during their trainings and climbing sessions on an annual basis. Dr. M.N. Bakin, cand. of med. sci, team physician mentioned in his reports that administration of peptide bioregulators contributed to minimization of height sickness symptoms and increased vital resources of the climbers. During the period of 2004 - 2005 St. Petersburg weightlifting team members used peptide bioregulators, which allowed the athletes to beat their personal best records and become members of the Russian Federation team [3-7]. Research on the effect of peptide bioregulators on reserve capacities of the Russian rhythmic gymnast’s team was conducted during the period of 2009 - 2010. The use of peptide bioregulators resulted in changed expression of HSPA1A and IL6 genes, which are responsible for stress resistance and normal functioning of the nervous system. Gene-specific stimulation of the athletes’ immune system was evidenced by the fact that after the course of peptides’ application the incidence of acute respiratory viral infection reduced by 80% [5,6,8]. It is noteworthy that short peptides, being a natural metabolic product of the organism, cannot be detected in blood or urine of athletes, which means they have no side effects and cannot be considered as doping, as distinguished from synthesized non-natural substances . Thus the research results obtained by the Russian scientists, mentioned above as an example, prove the perceptiveness of peptides’ application in sports medicine and explain the intense interest towards peptide substances among manufacturers of sport nutrition products. The main aim of research. The purpose of this study was to investigate the myoprotective properties of the peptide with the conditional name "IPH-АGAA" in cultures of human myocytes. Group 5 – addition of control peptide Lys-Glu in concentration 20 ng/ml. Peptide concentration 20 ng/ml was the most effective for the majority of dissociated cell cultures . Since IPH-АGAA peptide hasn’t been previously studied in dissociated cell cultures of myocytes, 3 of the concentrations listed above were chosen based on the previous experience of experimental work with other cells and peptides. Immunoprotective peptide Lys-Glu, whose properties have been described in scientific literature, was chosen as a control peptide . Peptides IPH-АGAA and Lys-Glu in a form of lyophilized powder were used for the research. Serial dilution of peptides with growth medium for culture cultivation was done to obtain the final concentration of 2 ng/ml, 20 ng/ml, and 200 ng/ml. Immunofluorescence method with the aid of primary antibodies to Myf5 (1:100, Abcam), Pax7 (1:250, Abcam), Ki67 (1:75, Abcam), p53 (1:50, Abcam), vimentin (1:100, Abcam) was used to reveal marker molecules. 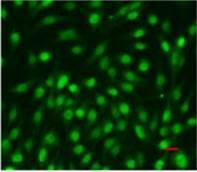 Fluorochrome- conjugated Alexa Fluor 488 (1:1000, Abcam, green fluorescence) or Alexa Fluor 647 (1:1000, Abcam, red fluorescence) were used as secondary antibodies. This myocyte molecular markers were chosen to characterize the main physiological processes of myocyte ontogenesis. Myoblasts’ (myocytes’ precursor cells) fusion into one multinucleate muscular fiber —syncytium (pic. 1) is one of the key moments of muscle formation during embryonal development. Pic. 1. Scheme of myoblasts differentiation and syncytium formation. Formation of muscular tissue and muscles – myogenesis – takes place during embryonic development. It has several stages, each controlled by specific proteins. Main stages in myogenesis are as follows: delamination (separation of cell layers), cell migration, proliferation (formation of excess tissue through cell division) and two differentiation stages. All those processes occur on intracellular level – this is the first stage of myogenesis. On the second stage, muscular tissue is formed, which requires cell fusion into multicellular muscle cells – myocytes, and formation of muscular fiber and satellite cells (i.e. cells required for regeneration and muscle growth in older age). Protein Pax7 – transcription marker, playing a key role in myogenesis through regulation of myocyte precursors’ proliferation. Mif5 protein (Myogenic factor 5) – key transcription factor for regulation of skeletal muscle myogenesis. Ki67 protein – acknowledged proliferation marker, expression of which can take place in all tissues. Protein р53 is a transcription factor acting as tumor suppressor through apoptosis activation in tissues. Vimentin is an intermediate filament protein, which can be found in conjunctive tissue and other tissues of mesodermal origin, including myocytes. Analysis of the effect of the target peptide on expression of the molecules provides an opportunity to determine myoprotective properties of the target peptide – on the one hand, and, on the other hand, to reveal the molecular mechanism of the peptide’s myoprotective action on various stages of muscle tissue formation, which is vital for determination of the peptide’s prospects for application in athletes doing strength sports involving muscle mass increase. Pic. 2. Immunofluorescence confocal microscopy of mesenchymal stem cells culture isolated from FetMSC human embryo muscle, passage 3, ×200: А – Pax7 expression (Alexa Fluor 647, red fluorescence), B - Myf5 expression (Alexa Fluor 488, green fluorescence). Red horizontal stroke in the lower right corner – forensic ruler, 20 micrometers. Figure 2 demonstrates examples of Pax7 and Myf5 nuclear expression in mesenchymal stem cells culture of FetMSC human embryo muscle. Substance coloring was done in accordance with a standard protocol. To analyze the obtained results confocal microscope Olympus FluoView 1000 (Japan) and programme software «Olympus FluoView ver 3.1b» were used. Statistical analysis of the experimental data involved calculation of arithmetic average, standard deviation and confidential interval for each sample using Statistica 6.0 programme. In the control culture of mesenchymal stem cells isolated from FetMSC human embryo muscle expression area of cytoskeleton marker (Vimentin) comprised 2,76±0,35%. Peptides IPH-AGAA in concentrations 2 and 20 ng/ml and Lys-Glu in concentration 20 ng/ml had no effect on vimentin expression in human myocyte culture (Pic. 5). IPH-AGAA in concentration 20 ng/ml contributed to increased vimentin expression 1,8-fold as compared to the control (Pic. 3,4). Pic 3-4. 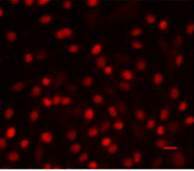 Vimentin expression (Alexa Fluor 647, red fluorescence) in a culture of mesenchymal stem cells from the muscle of a human embryo lines FetMSC. Immunofluorescence confocal microscopy, ×200: A – control, B – the addition of a peptide IPH-AGAA, 20 ng/ml. Pic. 5. Influence of IPH-AGAA peptide on Vimentin expression in MSC culture of FetMSC human embryo muscle. Thus, changes of cytoskeleton are more significant for embryo cells, since cells undergo differentiation. The obtained differences in the effect of IPH-AGAA peptide can result from specific characteristics of myocytes. . In control culture of mesenchymal stem cells isolated from FetMSC human embryo muscle, expression area of transcription factor of immature myocytes’ proliferation (Pax7) was 3,58±0,33%. IPH-AGAA peptide in 2ng/ml and 200 ng/ml concentrations and Lys-Glu peptide in 20 ng/ml concentration had no effect on Pax7 expression in human myocyte culture. IPH-AGAA peptide in 20 ng/ml concentration contributed to Pax7 expression increase 1,2-fold as compared to the control (Pic.6). Pic 6. Influence of IPH-AGAA peptide on Pax7 expression in mesenchymal stem cells culture isolated from FetMSC human embryo muscle. Thus, it seems likely that in culture of human myocytes peptide IPH-AGAA, affecting the remodeling of the cytoskeleton, regulating cell differentiation. In control culture of mesenchymal stem cells isolated from FetMSC human embryo muscle, expression area of transcription factor responsible for myocyte differentiation (Mif5) comprised 2,21±0,18%. Peptides IPH-AGAA in 2 ng/ml concentration and Lys-Glu had no effect on Mif5 expression in human myocyte culture. IPH-AGAA peptide in concentrations 20 ng/ml and 200 ng/ml promoted Mif5 expression 2,9- and 2,8-fold, respectively, as compared to the control (Pic. 7). Pic. 7. Influence of IPH-AGAA peptide on Mif5 expression in mesenchymal stem cells of FetMSC human embryo muscle. The acquired data proved that IPH-AGAA peptide stimulates differentiation of myocyte precursors only in human cell culture. This can be related to the fact that cell culture of human myocytes was isolated from an embryo, i.e. it possessed an ample quantity of immature myocytes, capable of differentiation. The data proving IPH-AGAA ability to induce human myocyte differentiation correlate with results of research on the said peptide’s effect on expression of Vimentin and proliferation transcription factor Pax7. In control culture of mesenchymal stem cells isolated from FetMSC human embryo muscle, expression area of apoptosis transcription factor р53 comprised 0,63±0,05%. IPH-AGAA peptide in concentration of 2 ng/ml and Lys-Glu peptide had no effect on р53 expression in human myocyte culture. IPH-AGAA in concentrations 20 ng/ml and 200 ng/ml reduced p53 expression 1,6- and 1,5-fold, respectively, as compared to the control (Pic. 8). Pic. 8. Influence of IPH-AGAA peptide on р53 expression in primary culture of rat thigh muscle. In human myocyte cultures, IPH-AGAA peptide in 20 ng/ml and 200 ng/ml had the same, though not very pronounced, antiapoptopic effect. The obtained results can be explained by the fact that in myocyte cultures, isolated from an embryo, apoptotic processes are poorly expressed (which is evidenced by low control values of p53 expression). Since peptides possess regulatory properties and their effect is aimed at support of cell homeostasis, the antiapoptopic effect of IPH-AGAA peptide in this experimental model was not that much expressed. In control culture of mesenchymal stem cells isolated from FetMSC human embryo muscle, expression area of proliferotrophic protein Ki67 comprised 2,79±0,21%. IPH-AGAA peptide in concentration 2 ng/ml and Lys-Glu peptide had no influence on Ki67 expression in human myocyte culture. IPH-AGAA peptide in 20 ng/ml and 200 ng/ml concentrations resulted in a 1,2-fold expression of Ki67 as compared to the control (Pic.9). Pic.9. Influence of IPH-AGAA peptide on Ki67 expression in mesenchymal stem cells of FetMSC human embryo muscle. Influence of IPH-AGAA peptide on proliferation of human myocytes estimated by Рах7 (specific for myoid cells transcription factor) and Ki67 (non-specific marker) has the same character. Although stimulating effect of IPH-AGAA peptide on Ki67 expression was detected in 2 concentrations, while for Pax7 protein – only in one. Thus, IPH-AGAA peptide reveals myoprotective properties, manifested in enhancement of proliferative processes and inhibition of apoptotic processes in myocytes, which makes IPH-AGAA a prospective substance for application in sports area. 1. In mesenchymal stem cell culture of FetMSC human embryo muscle, IHP-AGAA peptide in 20 ng/ml concentration contributed to 1,8-fold Vimentin expression as compared to the control. 2. In mesenchymal stem cell culture of FetMSC human embryo muscle, IHP-AGAA peptide in 20 ng/ml concentration contributed to 1,2-fold expression of Pax7 specific marker of myocyte proliferation as compared to the control. 3. 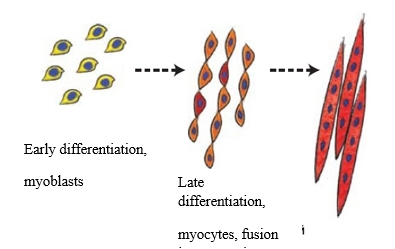 In mesenchymal stem cell culture of FetMSC human embryo muscle, IHP-AGAA peptide in 20 ng/ml and 200 ng/ml concentrations promoted expression of myocyte differentiation factor Mif5 2,9- and 2,8-fold, respectively, as compared to the control. 4. In mesenchymal stem cell culture of FetMSC human embryo muscle, IHP-AGAA peptide in 20 ng/ml and 200 ng/ml concentrations inhibited p53 expression 1,6- and 1,5-fold, respectively, as compared to the control. 5. In mesenchymal stem cell culture of FetMSC human embryo muscle, IHP-AGAA peptide in concentrations of 20 ng/ml and 200 ng/ml contributed to Ki67 expression increase 1,2-fold as compared to the control. 6. Myoprotective effect of IPH-AGAA peptide is determined by its ability to inhibit apoptosis manifestation and stimulate differentiation of human myocytes.